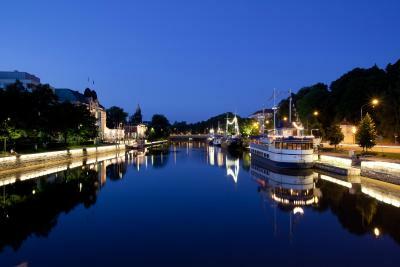 Lock in a great price for Radisson Blu Marina Palace Hotel, Turku – rated 8.6 by recent guests! Good breakfast and convenient location as it was close to my meeting place. Great location beside the river and close to the shopping center. Great location on riverside especially during summer. Walking distance from most places to see. Rooms were quiet, gym fine. Great location and excellent staff! We had to change a room after our arrival and this was done without question. Breakfast was very good, lots of variety for all of us. Definitely will visit again. Very nice location on the river. Staff recommended an upgrade to a river view, and were right. Room was very quiet and comfortable. Good recommendations for dinner. The breakfast buffet was lovely. The receptionists were very helpful. The room was modern and stylish with a lovely river view. Perfect for a day trip to Moominworld in Naantali as the Moominbus stops at the hotel. Excellent breakfast with decent amount of gluten free options, healthy selection, amazing staff and service. 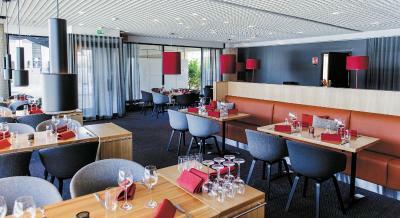 The hotel is right by the river and a short walking distance from great restaurants and cafes. service was great! staff were very helpful as we had a late night flight out and they were very accommodating! thank you! Clean, pleasant location on the water, and an easy walk to the town and train station, it was an enjoyable one night in Turku. Also, the breakfast was excellent, with a wide selection of fresh food. 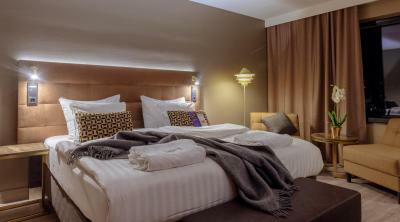 Radisson Blu Marina Palace Hotel, Turku This rating is a reflection of how the property compares to the industry standard when it comes to price, facilities and services available. It's based on a self-evaluation by the property. Use this rating to help choose your stay! 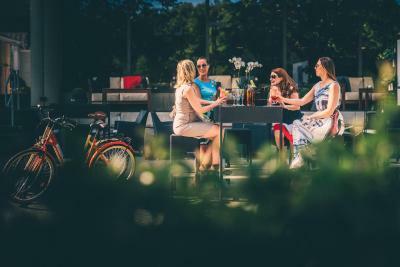 One of our top picks in Turku.Overlooking the Aura River in central Turku, this eco-friendly hotel offers free access to a Wi-Fi, a fitness center and 3 saunas. 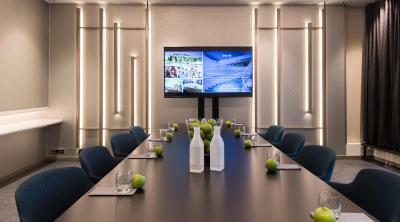 Modern equipped meeting and event facilities are bookable at Radisson Blu Marina Palace. 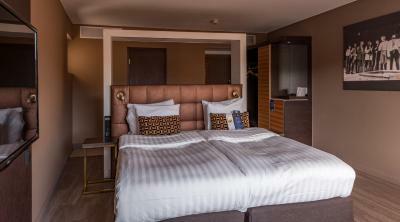 Radisson Blu Marina Palace Hotel’s baroque-style rooms feature wooden floors and luxury beds. All rooms have a flat-screen TV, tea/coffee maker and mini-bar. Air-conditioning and slippers add extra comfort. 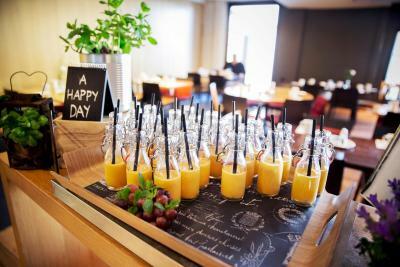 A generous breakfast buffet is served daily. Restaurant Grill It! offers river views, contemporary décor and grilled specialties. 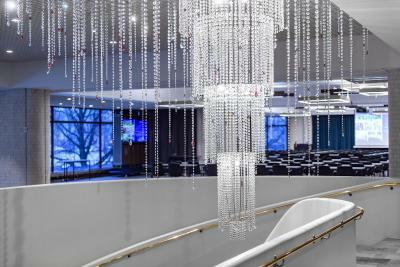 The lobby bar features comfortable seating and a summer terrace. The Coffee Bar café is open 24-hours a day. Reception staff can help arrange cruises and other activities. The medieval Turku Castle is a 5-minute drive away, while Turku Train Station is 15 minutes' walk away. Turku Airport is 5.6 mi away. 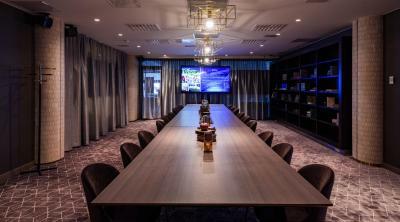 When would you like to stay at Radisson Blu Marina Palace Hotel, Turku? 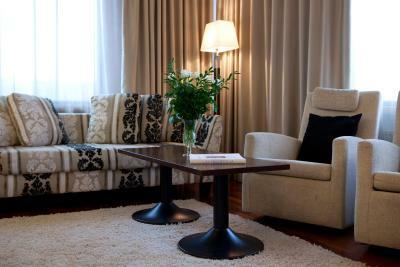 Extra spacious suite with a large living room, 6-person dining table and the best views of the River Aura. Private parking is available on site (reservation is not possible) and costs EUR 23 per day. 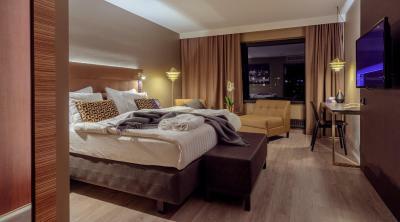 Spacious room with city views, a Nespresso coffee machine and luxury toiletries. Offers city views, a flat-screen TV and tea/coffee facilities. Upper-floor room with Aura River views and a flat-screen TV. Bathrobe and slippers add extra comfort. Offers Aura River views, a flat-screen TV and tea/coffee facilities. 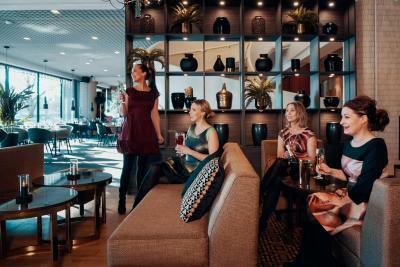 House Rules Radisson Blu Marina Palace Hotel, Turku takes special requests – add in the next step! Radisson Blu Marina Palace Hotel, Turku accepts these cards and reserves the right to temporarily hold an amount prior to arrival. When booking more than 5 rooms, different policies and additional supplements may apply. Please contact the property for more information. Very nice location. Very helpfull, great staff. I had some special request because my work there and all worked very well. Charging the full price, while the hotel is renovated and the sauna is not usable is not okay. Furthermore, the airconditioning is increadibly loud and the control panel is totally incomprehensible. 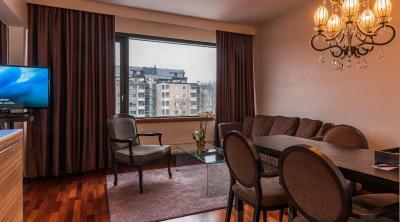 Comfy bed and good location in Turku city centre right next to river. Great breakfast. Very helpful and friendly staff. Expected bigger sauna place and maybe jacuzzi? Quite tight dressing room. Parking possibilities aren’t obvious and quite disappointing that the hotel doesn’t have their own parking place, so if it’s not a weekend, you have to pay 23€ per day, which is a bit auch :/. During the booking time, I mentioned that we’ll arrive with dog, but nowhere fee was visible. So at the time you are checking in, you get charged plus 20€ per dog, which is fine, but would be nice to know it in advance. Breakfast was really rich and amazing. Staff was really helpful and nice. Room is spacy and nice view to the river side. The air vent above the bed in the Business room no. 508 created a bit of a draft and was cold at night while sleeping in the bed. Great Breakfast, Great Location, Great Car Parking and very friendly and accommodating staff to arrange an additional pull-out bed for our little 1 y.o. daughter.